Body Butter – Aloe Vera Moisturiser for Dry Skin on Face and Body or Damaged Hair | Anti -Ageing Skin Care for Feet or Hands | 140 gr. WHITE OR BLUE JAR. E-BOOK INCLUDED: essential and aromatherapy oils skin care book included with the purchase of this beauty product. This luxury brand made in the UK, cruelty and paraben free and vegan friendly. PERFECT, SMOOTH SKIN: Helps get rid of wrinkles, fine lines, crows feet, puffy eyes and eye bags. May firm, lift loose, sagging skin, collagen production, pores and uneven skin tone. Can be used as anti -aging eye cream or on neck and forehead. HEALTH & PERSONAL CARE THAT WORKS: It can be used as cuticle oil for manicure and pedicure or as anti -aging hand cream. Alternatively, use after shower and bath to smooth skin on your hands and feet. HAIR TREATMENT: Can be used as deep conditioner and repair treatment for healthy or damaged, colored and dry or thinning hair. Apply as a mask for hair growth or to prevent hair loss. BODY CARE AND MASSAGE therapy at home or spa: Great for massaging muscles or sore legs after sports and fitness. Used for cellulite or cupping massage as well as lymphatic drainage and reflexology or relaxing foot or body, pregnancy and baby massage. White or blue jar. Looking for effective, natural skin and hair nourishment for smooth, glowing skin and shiny hair? – Skin or feet or heel and hands feeling dry, flaky or irritated? – Afternoon at the beach leave your skin burned? – Concerned about toxins harming skin? SINIVALIA Butter maximises skin hydration, relieving dryness after just one use. Aloe Vera contains over 200 active components including vitamins, minerals, and amino acids, making it a superior source of skin nourishment. It alkalizes, detoxifies and nourishes all at the same time! If you forgot to apply sunscreen, your skin needs to overcome the effects of ultraviolet exposure. Our body butter alleviates inflammation and decreases peeling after sunburn. THIS ITEM IS SOLD AS A 2 PART PRODUCT – AN OIL AND AN E-BOOK, BOTH ARE INCLUDED IN THE PRICE. In cold weather, the butter may harden. Please place somewhere warm so it softens and becomes manageable. 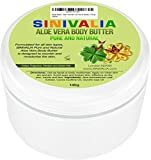 Posts related to Body Butter - Aloe Vera Moisturiser for Dry Skin on Face and Body or Damaged Hair | Anti -Ageing Skin Care for Feet or Hands | 140 gr. This entry was posted in Buy Supplements and tagged Ageing, Aloe, Anti, Body, Butter, Care, Damaged, Face, Feet, Hair, hands, Moisturiser, skin, Vera by TOSMS. Bookmark the permalink.